Friends In Places Even Higher Than That (New) Obtain an Emerald Hippogryph mount through the Recruit-a-Friend program. Account Wide. This mount is now confirmed as the new recruit a friend mount. Seems like an awesome looking mount, just kind of wish they made a new model as it seems to have the same model as the other hippogryph mounts. Schnelles Zhevra - Watch in 3D here. X-53 Reiserakete - Watch in 3D here. Herz der Obsidiannachtschwinge - Watch in 3D here. Smaragdgrüner Hippogryph - Watch in 3D here. Smaragdgrüner Hippogryph is the newest Recruit a Friend mount added in Mist of Pandaria Expansion, there is a thread for you if you're looking to recruit someone, Looking for a Recruit-a-Friend? Post here!, there you can post you're information to get recruited or recruit someone. Be sure to up vote the comments that are informative below me! Является новой наградой за акцию пригласи друга. Is this a two person mount? I think that's all we want to know. This achievement is now available with the updated RAF promotion. this mount is just like Heart of the Nightwing ! and transform you into the mount and u can carry your friend on your back ! how do i know that ? if you watch it in 3D u will see an option that it has sleep option ! Unlike the last two RAF mounts (Herz der Obsidiannachtschwinge and X-53 Reiserakete), this one is not a two person mount. Updated 11/12/2013: "...players can choose between all of the RAF mounts, including those that have been removed for years..." Read more on this here. all i hope is that RAF goes to level 85 now instead of 80! then i will love blizzard long time! I will gladly trade in my Obsidian Nightwing for this. Emerald Hippogryph hints at 'Emerald Dream' as the next expansion? Ladies and gentlemen, rev up your speculation engines! So is it known if we can "turn in" our old RAF mount for this? I hope so, because it looks beautiful. Schnelles Zhevra teaches Schnelles Zhevra - The original RAF mount, ground-only. Grants the achievement Freund in der Höhe. X-53 Reiserakete teaches X-53 Reiserakete - The second RAF mount, a 2-seater rocket. Gives the achievement Freunde in noch größerer Höhe. Herz der Obsidiannachtschwinge teaches Obsidiannachtschwinge - The third RAF mount, which transforms the owner into a winged black catlike mount that can carry a passenger on your back. Grants the achievement Freunde in noch viel größerer Höhe. Smaragdgrüner Hippogryph teaches Smaragdgrüner Hippogryph - A lovely green and orange hippogryph mount. Gives the achievement Freunde in noch viel, viel größerer Höhe. Glutmähnenschlachtross teaches Glutmähnenschlachtross - A blackened winged horse covered in bright orange flames. Grants the achievement Freunde in schwindelerregend großer Höhe. Münze des goldenen Schweins teaches Goldenes Schwein. Münze des silbernen Schweins teaches Silbernes Schwein. Verzauberte purpurfarbene Jade teaches Zipaotiger. I have all of the mounts from RAFing a second account several times. If you're debating which reward to choose, I'd recommend either of the two-seater mounts: X-53 Reiserakete or Obsidiannachtschwinge. The ability to carry a passenger is perfect for your RAF adventures! I'm just gonna sum up the new information on RAF. Because players were complaining that when recruiting their second, or third, or etc. person, they couldn't get another reward, past their already obtained Zhevra, Touring Rocket, and/or Heart of the Nightwing, Blizzard revamped their system. One of 4 BoA Mounts, listed above. Herz der Obsidiannachtschwinge - Flying mount (my favorite! ), one seater :P - Technically... since, you, yourself actually turn into the mount, and can carry one other. One seater. Two people. X-53 Reiserakete - Flying mount, two seater. Got all the mounts? Don't worry, pick up some sweeeeeet pets! The following are NPC links, not item links. Anyways, you get to choose one, as far as I remember. Furthermore, to those who are still unacquainted with the RAF program, you and your friend get 300% experience till level 85, presuming you are partied together while leveling, within 4 levels of one another. You also get some other bonuses, mostly in terms of power leveling, through granting levels and such. More can be found at the link at the bottom, along with a complete blue stickie, and a video. For the people who don't wanna click the link down there (although it's a pretty dandy guide), I'll explain level granting here. When you level up, with your friend, the person who was recruited, gets an extra level every two levels earned. This extra level can be granted to the recruiter, granted that the recruiter is a lower level than the recruited. Personally, it makes the most sense to pick a two person flying mount, either the rocket or the nightwing, because it makes it easier to fly you and your partner places. Here's a short "guide" on how RAF is best used. 1) If you're only it for the mount, or the pet, or reward, just ignore this. 2) If you actually know the person you're recruiting, i.e. 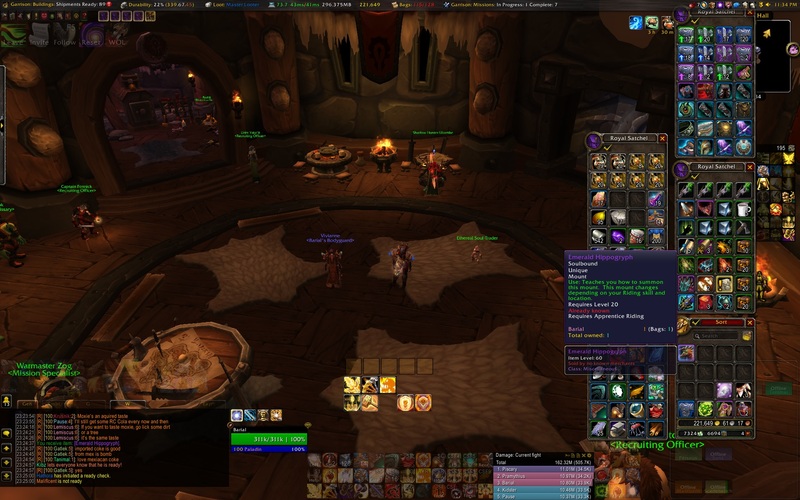 not some random person from ingame who you're paying to RAF with gold, to get a new mount, read on. 3) Make your characters. Ideally, this is a new person you're recruiting (not a multi-boxer, I presume). Make sure you guys KNOW the best benefits each class can provide in conjunction w/ races. THIS IS A SERIOUS POWER LEVELER, do not waste it! If you explain PVP and PVE to your friend, and they decide they wanna try PVP healing, and settle on a Priest, for example, go over racials, and how they affect the gameplay at 90, before you power level. For example, Arcane Torrent, an AoE silencer with 2 minute CD, is a pretty handy tool when in PVP. 4) Once you've decided on what to level, you should ALWAYS stick together, in a party, when leveling. YOU WILL GET CLOSE TO 300% experience, if you follow this one step. 5) Always stay within 4 levels of one another. If you guys are literally PB&J, you'll be at the same level, with the same amount of experience, as well. Most likely tho, one of you will choose a gathering professions that offers more experience. In cases like this, either log off till your friend catches up, or cap XP gain. In Orgrimmar and Stormwind City, there are NPCs who can stop you from gaining XP (used by twinks), so that even if you complete quests etc., you don't level up. Try it, it's fun to wreck 80-84 BGs in MoP BoE gear and other similar items. 6) If the recruiter is one level ahead, wait until the recruited is 1-3 levels ahead, before playing, and have the recruited use extra levels to insta level you. 7) ^ DO NOT WASTE INSTANT LEVELS. 8) ^^ THEY CAN LITERALLY HELP YOU SKIP ALL OF NORTHREND OR SUCH, IF YOU HATE IT. 9) Most of all - have fun. If you're playing with a new guy (or girl, ain't no sexism here), don't overwhelm them with crap about racials and all. Mention it. Say it can affect the game. But don't stress it. They'll get sick of it and quit. Don't force your friend to play. You have 90 days of 300% experience. Have fun with it, take it as it comes. Edit: Added in level granting. For everyone wondering, if you are a previous RAF user, and if you for an example got the rocket or nightwing, you can now choose a new reward on top of your previous reward the first time you enter the game after the update. Lame in comparison to Nightwing. This is an extremely nice looking mount with fantastic sound effects. Easily one of my top ten favorite in the game including mounts I don't have or even will ever get. Love the look of this mount. And since it is small like all other hippogryphs it is a convenient mount to use around town and in BGs. It has the hooves facing inwards! Hmm, what happened to the tradition of having "Reins of ." ? Why does it look like it has overgrown hooves? They look vaguely like the shape of wooden clogs. Same model as of Arthas' Invincible, so if you can't get one having this might help a little... I guess. I really like the My Little Pony reference: "magic of friendship". I got this mount when it first came out a few years ago so it's useless to me - I was tabbed out browsing amazon when I heard the little loot sound made when something goes into your bags. I haven't RaF'ed anyone since earning this mount years ago, and there was no interface or anything, I tabbed back to the game and it was just sitting in my bags. Very bizarre. So not much of a reason to choose this unless you're a completionist or really like the color. "...can only be tamed by the magic of friendship." Because friendship is magic! "Diese majestätischen Tiere gibt es in vielen Farbtönen, doch die Smaragdgrünen können nur durch die Magie der Freundschaft gezähmt werden."